In the Standard Platform League, soccer is played with a standardized robot platform, i.e. all teams compete with identical robots and only differ in the software they develop. The robots operate fully autonomously, such that there is no external control by humans or computers. 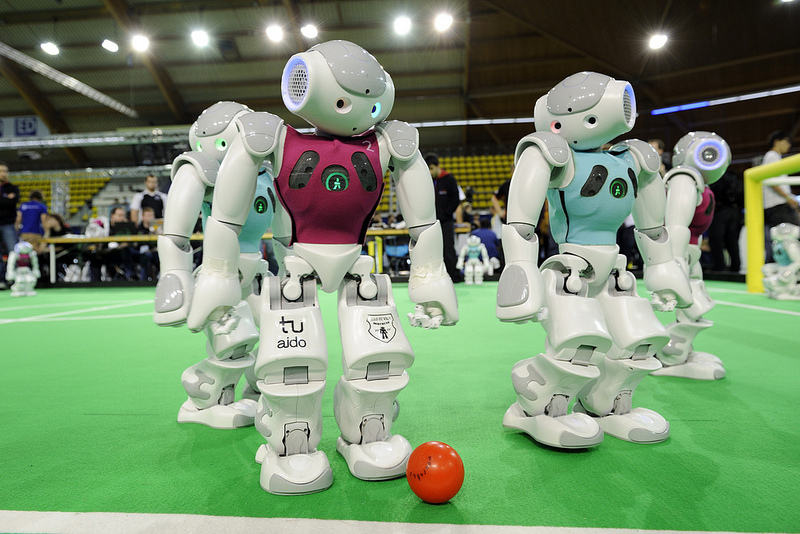 However, the robots can communicate with their teammates and receive the decisions of the referee via wireless communication. Each game is composed of two 10-minute halves. In these games, teams of five robots play against each other on a 9m x 6m field. The current standard platform used is the humanoid H25 NAO manufactured by Aldebaran Robotics. The H25 NAO robot has 25 actuated joints – five in each leg, five in each arm, one in each hand, two in it’s neck, and one in it’s hip. In it’s head, two cameras are integrated for perceiving the environment. In it’s chest, sonar sensors can measure distances to other object on the field. In it’s feet there are sensors to measure ground contact and the contact with the ball. One accelerometer with three axis and two gyroscopes each with one axis allow measuring the pose of the robot’s torso. CHALLENGE: In the seventh year of the league, teams must handle the complexities that arise from a substantially larger field and an additional teammate (as well as an additional opponent). Play is trending towards that of real soccer as only one ball contact is allowed by the kicking robot on penalty kicks and robots wear jerseys. Some of the challenges the teams face involve: keeping track of the robots’ positions on the field, bipedal walking and other motions. A final challenge that may become more important with the larger field size introduced this year is cooperation between teammates. Such corporation may be in the form of passing, information sharing, or other forms.